A Palestinian teenage boy died from, on Sunday evening, from serious wounds he suffered a day earlier, after Israeli soldiers shot and seriously injured him, in Central Gaza. The slain Palestinian has been identified as Emad Khalil Shahin, 17, from the Nusseirat refugee camp in Central Gaza. Palestinian sources said the teen was near the fence on the Palestinian side, when the soldiers shot and dragged him away. 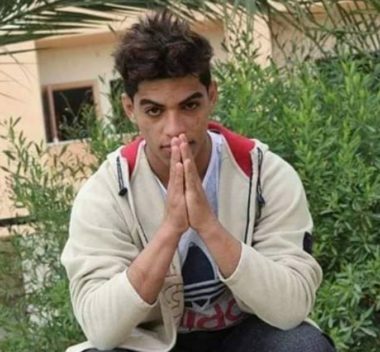 Shahin suffered a very serious injury, before the army later airlifted him to Soroka hospital, in Be’er as-Sabe’ city (Beersheba), where he died from his wounds. 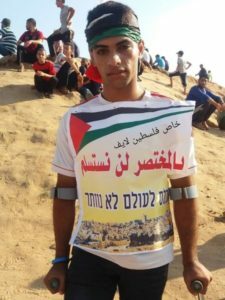 It is worth mentioning that the Shahin was injured by live Israel army fire several times, including one incident when he had several toes amputated, since the Great Return March procession started on Palestinian Land Day, March 30th, 2018. On Saturday, a Palestinian child, identified as Mohammad Nasr al-Reefy, 14, died from serious wounds he suffered after the army fired a missile at his home, during the Israeli war in the Gaza Strip, in the summer of 2014.